Members learn how their offices work. 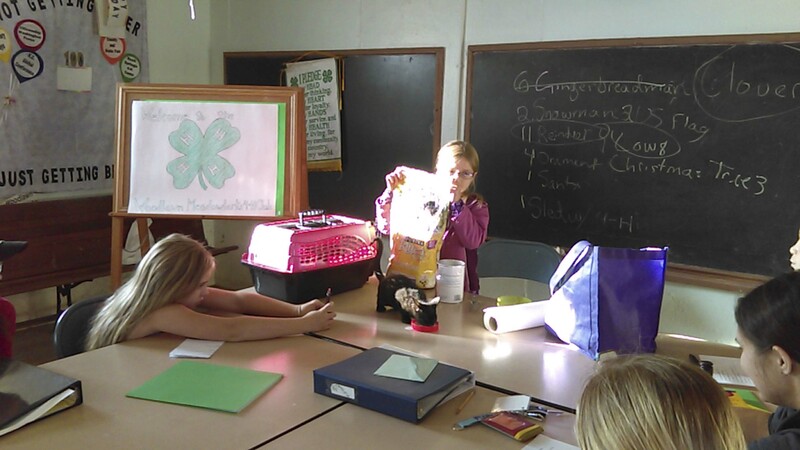 On Oct. 13, the Woodlawn Meadowlarks started their new 4-H year. 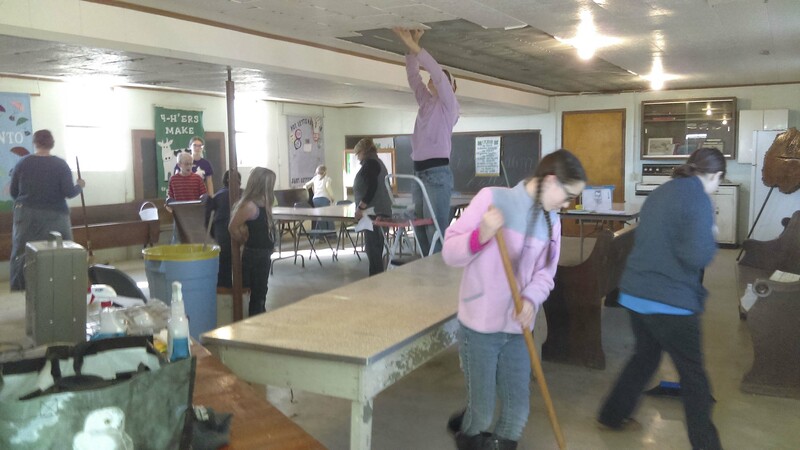 Before the meeting they cleaned up the Woodlawn Hall as a service project in the 48 hours of 4-H. Members scrubbed, swept, washed, and dusted getting the hall ready for another year while the adults worked on ceiling repairs and plumbing. An officer installation was held before the meeting. Assistant Club Leader Shirley Walker, handed out baking ingredients to each officer that represented how each office holds the club together like the ingredients hold together to make a delicious recipe. Kayla Devore reported for the marketing committee that the club had a display at the Sabetha Library for National 4-H Week. Club Leader Emily Stoller recognized Kansas State Fair participants. The club voted to continue to make piñatas for Christmas. Everyone suggested ideas and voted on their favorites. This year the club decided to make three piñatas: a four-leaf clover, a reindeer and a cow. 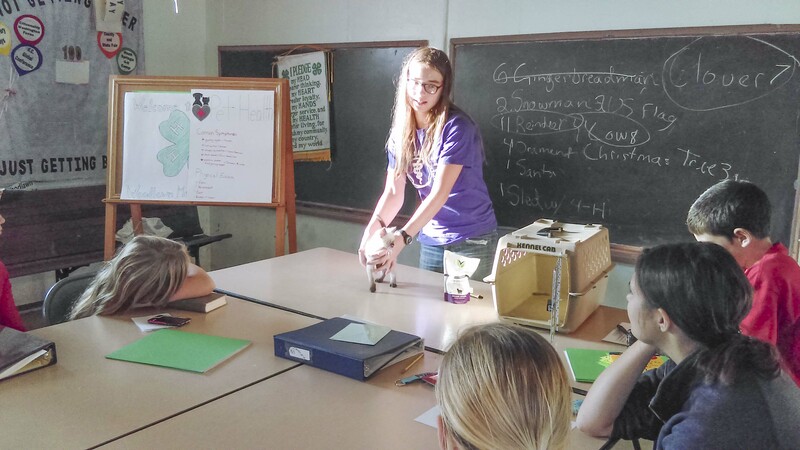 For the program, Susannah Walker gave a talk on pet health and showed how to give a physical exam on her kitten, Fiona. Anastasia Walker demonstrated how to make kitten formula and fed her kitten, Phineas. Luke Metzger led the club in playing fruit salad for recreation. The Walker family brought cookies for refreshments. The Woodlawn Meadowlarks meet in the Woodlawn Hall on the second Saturday of the month at 4:30 p.m.
Susannah Walker shows how to give a physical exam on her kitten. Anastasia Walker feeds her kitten. Club members work on hall clean-up during the 48 Hours of 4-H.